Or view larger version. Grocery store in Chinatown of Oakland, California. March 30, 1942. Dorothea Lange, photographer. Gelatin silver print. Collection of Oakland Museum of California. Gift of Paul S. Taylor. "IN THIS SOLEMN HOUR WE PLEDGE OUR FULLEST COOPERATION TO YOU, MR. PRESIDENT, AND TO OUR COUNTRY. THERE CANNOT BE ANY QUESTION.THERE MUST BE NO DOUBT. WE, IN OUR HEARTS, ARE AMERICANS - LOYAL TO AMERICA. WE MUST PROVE THAT TO ALL OF YOU." 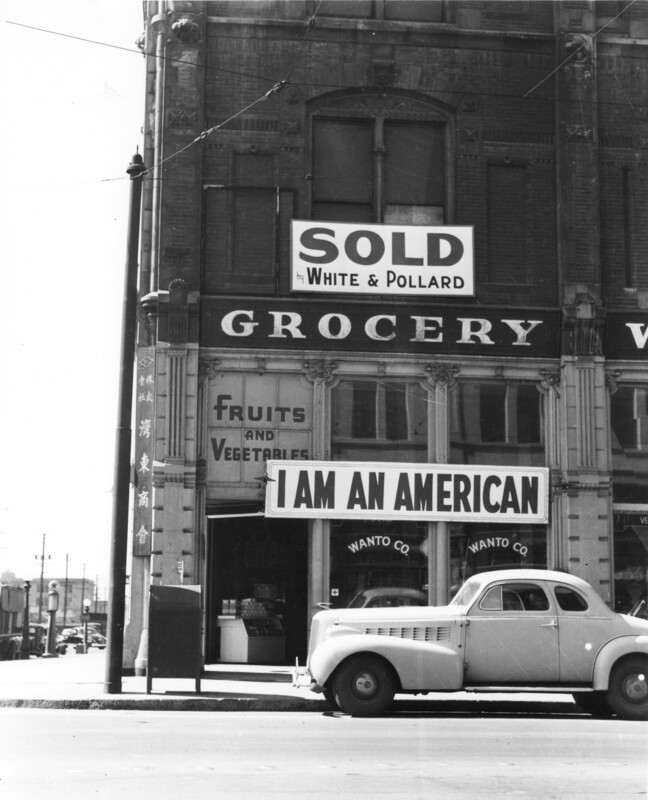 Expressing sentiments contrary to these patriotic declarations, Congressman John Rankin wrote into the Congressional Record, Feb.19, 1942, "I'm for catching every Japanese in America, Alaska, and Hawaii now and putting them in concentration camps … Damn them! Let's get rid of them now!"